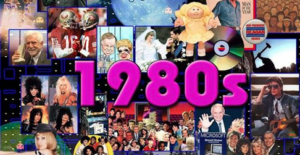 March 3, 2019 – Dress up in your favorite 80s digs (awards for best dressed) and support a great organization at Rotary Fun Night. The Fun Night Fundraiser is scheduled for Saturday, March 23 at the Phil Gainer Community Center from 6 p.m. to 10 p.m. There will be live music, a silent and live auction, 50/50 drawings, and Wine Pull. Your ticket includes cash drawings, an open bar and food provided by Vintage Restaurant. Contact a Rotarian to purchase a ticket. The Center is located at 142 Robert E Lee Ave Ext, Elkins, WV 26241. October 20, 2018 — Officials broke ground in mid-October 2018 on a project that officials say will benefit the community for years to come. After only a year of fundraising efforts, a $139,000 project will come to life as early as 2019 in the Elkins Town Square. 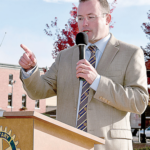 The Rotary Club of Elkins, through amphitheater project chairman and Rotary Club member Hoy Ferguson, has worked to raise funds for the construction of the amphitheater that will be used for live entertainment and other activities downtown. Ferguson shared his appreciation for the nearly 100 businesses, organizations, agencies and individuals who contributed to the project. The Snowshoe Foundation, which contributed $25,000 to the project, was represented by Voras Haynes, vice president of the board of directors, who said he believes this project will be a great addition to the Elkins community. Following the groundbreaking ceremony, Ferguson elaborated on the project, saying the project was able to be completed quicker than expected due to overwhelming community support. He added he believes the new amphitheater will provide a gathering place for a multitude of downtown Elkins events. Fifth grade students of North Elementary give the Rotary Club of Elkins a “Hip Hip Hooray!” for their Merriam-Webster’s Student Atlases. The club has been providing atlases to every fifth grader in the county since 2010. 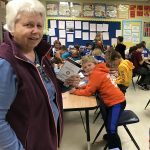 Randolph County fifth graders were recently visited by members of the Rotary Club of Elkins and received free editions of the 2017 edition of Merriam Webster’s Student Atlas. Over 335 books were distributed to fifth graders in the county. Randolph County is home to ten public elementary schools, and each school recently visited by a member of the Rotary club. Pickins was not included since the elementary school has no fifth graders this year. Pat Schoonover, Project Service chair for the Rotary Club of Elkins and retired Randolph County teacher, oversees the student atlas program and organizes distribution efforts. 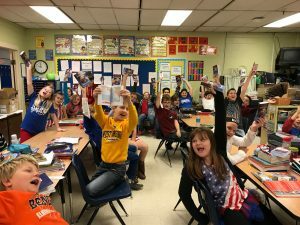 Students of North Elementary received their atlases lasr week amid an excited display of questioning and an enthusiastic offering up of a “Hip, Hip Hooray” to the Elkins club. Each year the Rotary Club of Elkins works with Rotary International to procure the funds for the project, and each year the Randolph County Board of Education approves the project. Club members, with the help of the fifth grade teachers throughout the county, distribute the books. Pictured left to right: Past president, Mike Ellis, new Board of Directors members: Molly Propst, Scotty Marshall, Scott Harris and Mike Bell. New officers included Joann Fussell, Sergeant-at-Arms, Karen Jacobson, Program Chair, Merllene Yorkey, Executive Secretary and Treasurer, and Vice President, Brad Walters. 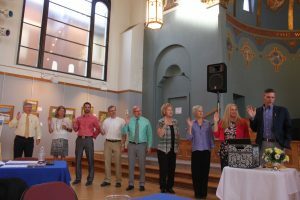 The new Rotary International year began July 1 and the Rotary Club of Elkins was ready for a new year of community service with the installation of new officers and Board members to serve during the 2017-2018 year. The Installation took place Monday evening, June 26 at the Randolph County Arts Center in Elkins. Past president, Mike Ellis handed the gavel to incoming President, Carl Nichols, who introduced the new Board of Directors members: Molly Propst, Scotty Marshall, Scott Harris and Mike Bell. New officers included Joann Fussell, Sergeant-at-Arms, Karen Jacobson, Program Chair, Merllene Yorkey, Executive Secretary and Treasurer, and Vice President, Brad Walters. Continuing Board Directors included: Matt Davis, Patricia Schoonover, Jeffrey Welshonce, Sid Gillispie and Jon Steen. 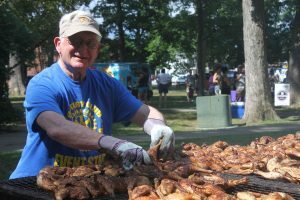 Constantine “Jack” Pappas, a long-time Rotarian, helps barbeque the chicken during the Randolph County Humane Society “Woofstock” event. Community service initiatives kicked off in mid-July with the Randolph County Humane Society’s “Woofstock”, an annual fundraising event that brings needed funds to the county’s animal shelters. The Rotary Club of Elkins offered their popular Chicken BBQ, with all proceeds going toward the Randolph County Humane Society (RCHS). A check for nearly $1500.00 was handed to Lisa Preusch, RCHS Board Director at the following Monday Rotary meeting. During the Augusta Heritage Festival in mid-August, another two hundred chickens flew off the Rotary BBQ pit! This event was a club fundraiser with proceeds to be used throughout the 2017-2018 Rotary year for various community projects. Elkins Rotarians Merllene Yorkey and Hoy Ferguson help with the August Bi-Annual Blood & Health Screening. 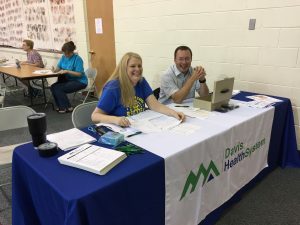 Also, in mid-August nearly 75 local residents took advantage of discounted prices during the recent Rotary Club of Elkins Blood & Health Screenings. This bi-annual event, held at the First United Methodist Church in Elkins, in partnership with Davis Medical Center, is one of the Rotary Club of Elkins’ community service projects. The next Blood & Health Screening is scheduled for February 2018. Youth Health Services and Advanced Hearing Solutions, both of Elkins, offered health tips and hearing tests at the event. A drawing for an Amazon Echo Dot was also held, with Chad Harmon holding the winning ticket. 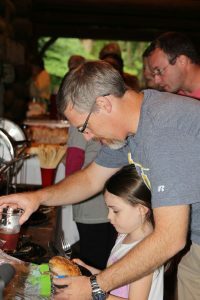 Rotarian, Scott Harris, helps his daughter get a drink at the Rotary Club of Elkins family picnic. Elkins Rotarians said goodbye to the summer season with an evening of fellowship during the annual summer Family Picnic. Catered by The Vintage of Elkins, the downhome picnic buffet was enjoyed by attending Rotarians, family and friends. To keep in touch with the Rotary Club of Elkins, join our Facebook page.